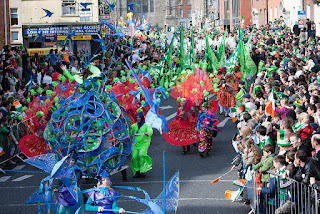 St Patricks Weekend in Dublin 14th – 18th March – a weekend not to be missed!! On Thursday the 14th of March, why not join in with the live music and street performances at various locations throughout the city, the city is going green, many iconic buildings will be turning green for the celebrations, custom house and the convention centre have been confirmed to take part. Learn about the history of t Patrick and take part in the Footsteps of St Patricks Walking Tour. Dance and laugh the day away with the Trad stage and comedy night planned. On Friday the 15th of March, why not take the kids to the City at Play Funfair, attend the interesting talk about Global History of the Irish Abroad or attend the I love my city – short film showcase. On Saturday the 16th of March, why not view the film, the secret of Kells at Temple Bar; bring the kids to the story teller at the Museum to hear about the wonder of snakes. Take part in the St Patricks Festival 5K Road Race, cheer on at The Gannon Cup – Irish University Boat Races, take a trip down memory lane at the Some Forgotten Unforgettable Irish talk and maybe later that night at 8.30pm attend the Ceili House Live at The National Concert Hall. 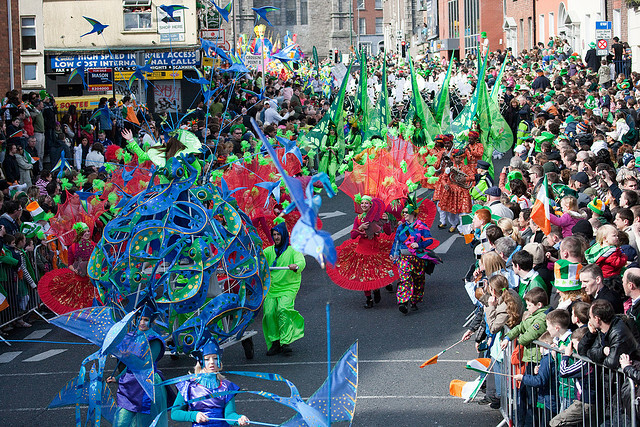 This will be a very special event – as part of The Gathering Ireland 2013 for the first time ever, St Patricks Festival will be inviting up to 8,000 people around the world to march in the Parade in Dublin. The peoples parade is a once in a lifetime opportunity! The parade will start at Parnell Square and will continue to O’Connell Street and over O’Connell Bridge to Westmoreland Street. It then winds its way down Dame Street and Lord Edward Street passes by Christchurch Cathedral and along Patrick Street where it finishes just past St. Patrick’s Cathedral. There are many more events on the day such as; Irish Craft Beer Festival, St Patricks Walking Tour, Live music and street performance at various locations throughout the city and finally why not attend the fantastic Stockton’s Wing at the National Concert Hall. On Monday the 18th of March, there will be a Festival Treasure Hunt, The Nightmare Club, City ay Play Funfairs and the Irish Craft Beer Festival and St Patricks Walking Tour to attend. Bewley’s Hotels have some great offers available and our hotels are located at central locations throughout Dublin and near all public transport routes, which makes them the ideal choice for your visit to Dublin for St Patricks Weekend.